Environmental charity Keep Northern Ireland Beautiful is introducing Green Key to Northern Ireland. Green Key is an internationally recognised eco-certification for the hospitality sector, thereby boosting the local tourism and hospitality industry and championing sustainable best practices. Hospitality businesses in Northern Ireland interested in learning more about Green Key and how it can help them boost their green credentials should contact Dr Susann Power at susann.power@keepnorthernirelandbeautiful.org or on +44 28 9073 6920. Green Key now has national representation in 41 countries around the world. Within the frames of the UN Year of Sustainable Tourism for Development 2017, a Sustainable tourism conference for the Kaunas region in Lithuania was held on 23 November 2017. The conference was initiated with a funny video interviewing people about their knowledge about sustainable tourism. Not surprisingly, many did not know the meaning of the word "Sustainability", so the conclusion after the video was that everyone working with sustainable tourism should explain the meaning of sustainability without necessarily mentioning the word. 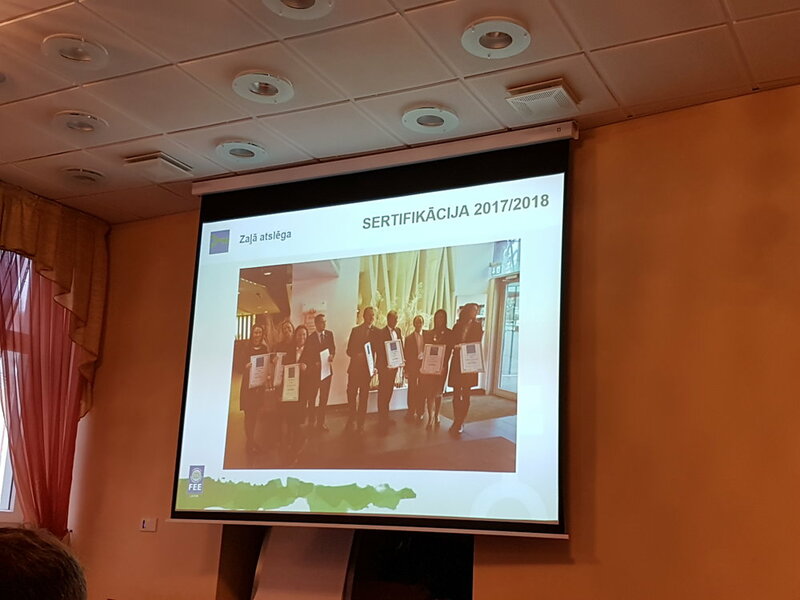 The Ministry of Economy (Tourism Department) presented the sustainable tourism strategy in Lithuania as well as the figures for tourism in the Kaunas region. The representative encouraged conference participants to use 2018, as 100 years of Lithuania as a country, to promote sustainable tourism and the natural beauty of the country. Other tourism experts explained how sustainable tourism fits with the UN Sustainable Development goals. In the conference, Green Key International Director, Finn Bolding Thomsen and National Operator, Renaldas Rimivicius had the opportunity to present Green Key with focus on the eligibility of the programme for small accommodations. The environmental manager at Green Key awarded Park Inn by Radisson hotel in Kaunas gave a presentation about the environmental and social work of the hotel leading to the Green Key award. Finn Bolding Thomsen was also interviewed about Green Key for the regional TV station. The reporter wanted to know more about Green Key and the benefits of joining the programme as well as observations that Bolding Thomsen made about the Green Key awarded hotel where the conference was held. For our Lithuanian speaking followers, click on the picture to see the interview with Bolding Thomsen by Init TV (starting at 21:00). Green Key has National Operators in more than 40 countries and many of them organise national seminars, with the aim to raise awareness on Green Key and help current and upcoming establishments with the implementation. On 22 November 2017, Green Key Latvia organised its annual Green Key seminar for current and upcoming establishments. In the seminar, the Latvian National Operator Janis Ulme focused in detail on how to ensure the implementation of the new Green Key criteria that took effect last year. Green Key's International Director, Finn Bolding Thomsen, attended the seminar and presented the international dimension of the programme and tools, promotion and support for the awarded establishments done by Green Key International. He encouraged the participants to use Green Key as one of the ways to promote Latvia as a green destination, not least during 2018 where Latvia celebrates 100 years as a country. In addition, the seminar had informative presentations about labels and schemes for cleaning products, furniture, food and beverage, energy and other topics. The seminar was held in Green Key awarded Hotel Avalon in central Riga. The environmental manager of the hotel informed the attendees about the environmental work at the hotel, and a guided tour in the establishment was offered to the participants at the seminar.